It is safe to say that Fighting Fantasy cemented a literary genre that had barely been explored in the past. The series of books took some experimental writings that toyed with the idea of letting the reader determine the course and, ultimately, the outcome of the story. For a lot people, the Fighting Fantasy series of books were the first foray into Fantasy and an entry point to develop a passion for reading, but probably none felt that passion as strongly as Jonathan Green, who, after the first spark of enthusiasm for the books, managed to become one of the outmost authorities in the subject, and, probably, the best writer since the original Ian Livingstone and Steve Jackson. Now, with a few books under his belt, Jonathan is trying to procure money to write YOU ARE THE HERO, a book about the story of Fighting Fantasy. Since paying for something that hasn’t been written yet is something that shouldn’t be done lightly, I thought I’d ask Jonathan a few – some hard – questions to find out what the plan is and why he’s doing all this. You are a very experienced writer with many titles on your portfolio. Why start this project? What do Fighting Fantasy books mean to you? Fighting Fantasy gamebooks are the reason I’m writing today. The Warlock of Firetop Mountain, when it was published in 1982, inspired me like no other book ever had and confirmed what I already knew – that I wanted to be a writer. I love the books with a passion and still love writing gamebooks today, despite having had fifteen novels published now. I wrote a piece for SFX Magazine early in 2012 about the history of Fighting Fantasy and its legacy and realised that even after 7,000 words I had barely scratched the surface. That thought stayed with me and I continued interviewing the creators long after the piece was published until we come to this moment, when we’re halfway through the Kickstarter, with almost two thirds of the funds needed to produce the book raised. Apart from your writing career, which is quite varied, what makes you the best person to write this book? Why should we trust you’ll come out with a great book? Because I’ve had more than forty books published already, with another ten, or so, in the works. Because I’m passionate about gamebooks. Because I’ve written seven FF gamebooks myself and so have a unique insider’s view on the series. Because I’ve already interviewed a veritable host of people involved in the series or directly influenced by its impact. Because Steve Jackson himself once said to me, “You are the perfect person to write this book.” Will that do? Even with your obvious passion of the subject, and considering how much they mean to a lot of people out there, how have you dealt with the pressure of going through this? There are lot of expectations! The thing that’s been most stressful so far is managing the Kickstarter for a month. It just takes up so much time and nervous energy! I’m pleased that people have high expectations for YOU ARE THE HERO – so do I! I just want to get the chance to prove to people that I can meet them. What do you think will make the story of these books so interesting? People are always fascinated by the creative process; just look at all the ‘Making of…’ documentaries on DVDs. There are also some great stories surrounding FF, such as why the books run to 400 sections, or how Ian Livingstone’s newest gamebook Blood of the Zombies almost never happened. And Steve Jackson and Ian Livingstone are great characters and fantastic after dinner speakers. So imagine that transferred into book form. Without giving anything away, have you found something you really didn’t expect and have shocked or amazed you? What is the process behind the writing of this book? I’ve already researched a great deal of the history of the series, right down to how individual books came to be written. I’ve interviewed many people involved already, but the next stage is to carry out more interviews. I’ve also gained the permission of various artists to have their work featured in the book but once funding is achieved I’ll be able to commission some brand new art for the book. I’m even talking to professors of game play to bring that side of things into the book. Once all that’s in place, I just have to sit down and write the thing! How much effort and time have gone into finding the right people for interviews and research? How did you know who were the right people? Many of them are the writers and artists who created the books in the first place. The others are people in the business like me, who I already knew were big fans of the books. Others have come out of the woodwork, as it were, since they discovered I was working on this project. But arranging interviews and collating questions has certainly taken a lot of time. £15000 sounds like a lot of money. How are you going to spend it? It is a lot, but that’s because it costs a lot to publish a half decent book. And YOU ARE THE HERO is going to be way better than half decent. For a start, Kickstarter and Amazon take their cut, then I’ve got to pay the artists, pay to have some of the rewards made, pay to have the book printed and shipped… It all adds up. And £15,000 is the minimum I need to do this. If we can raise more the book will be even more amazing, with even more content. How did your relationship with Ian Livingstone and Steve Jackson start? By the way they called you to the stage at Dragonmeet, they seem to value you very highly! I believe Ian (or it might have been Steve) read my sample proposal for Spellbreaker, my first published FF gamebook, but I didn’t have any direct contact with them until around 2006, when Wizard Books showed an interest in finally publishing my fourth FF book Bloodbones. And when I say ‘direct’, it was via email at first. I met them in person some time after that – Ian first and then Steve – but the first time the three of us met together was at the UK Games Expo in 2010. They’ve both said very pleasing things about my work and it was wonderful went Ian said he was going to call me up to talk about YOU ARE THE HERO at the end of the FF seminar at Dragonmeet. You have now written some adventure books and Fighting Fantasy books as well, how has that experience been as a writer, compared with writing “normal” stories? Everything’s written in the second person present tense for a start. Character development has to be handled differently (and yes, there can still be character development). You have to write more concisely. You can’t easily include flashbacks or scenes from another character’s point of view. But then the great thing about writing a gamebook, as opposed to a novel, is that you can explore every narrative path you like, whereas in a novel you have to stick with just one and follow it through to its ultimate conclusion. What is next for you after this project? And with that, my thanks to Jonathan for answering my questions. I really hope it will have inspired to take a look at the Kickstarter project page and, with a bit of luck, also to back this project. Of course, if you read this in the future, head to your local book store and get a copy. It makes terrific reading! 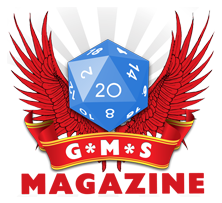 NextThe G*M*S Magazine RPG Podcast Episode 74–Alternative ways to promote your game!